Recipe for Reindeer Martini. The original martini, created by bartender Sherri Flynn of Harry's Velvet Room in Chicago, is sure to add to the festive nature of any holiday gathering. 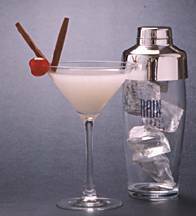 Shake over ice and strain to serve straight up in a martini glass, garnished with a cherry and two cinnamon sticks for antlers.